Welcome to this week's edition of the Choose Your Own Block-Along, and thanks to those of you who are linking your progress! 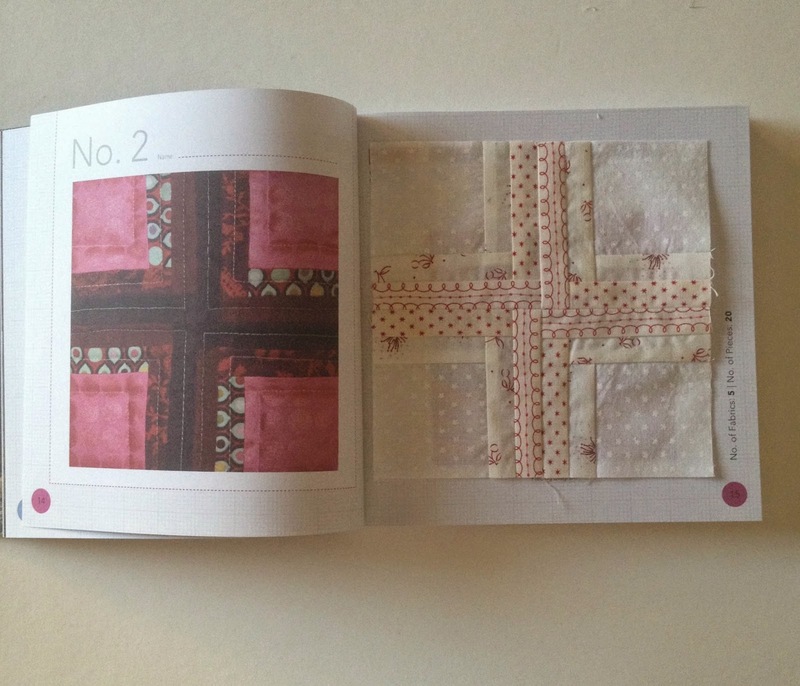 This week I made blocks 9 and 10 in the Tula Pink's City Sampler book. I think it takes longer to choose the fabrics than it does to sew the blocks! I have now made one block for each of the ten color/value categories I set up. I'll be sure to post a picture of them next week, along with the new blocks. 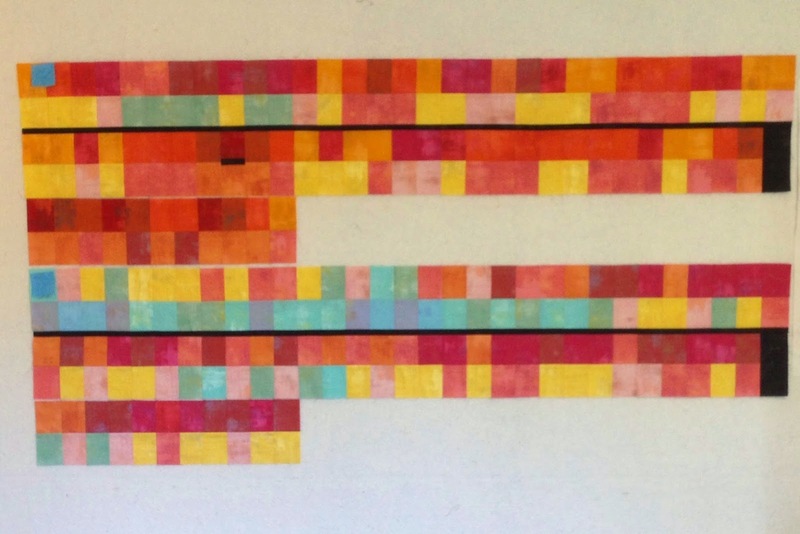 Be sure to see what blocks Rene' and Michelle have made in the past week. This all started back in October of last year. Has it really been nearly a whole year? 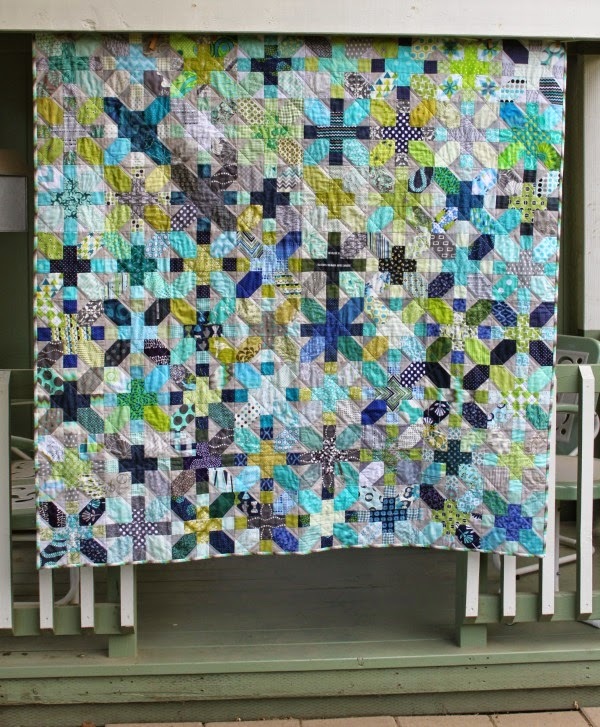 Carla (Lollyquiltz) and Susan (Patchwork and Play) came up with a plan for a block swap that sounded like too much fun. Every month we each made a set of blocks for ourselves and an identical set for our swap partner. We decided on a total of 64 blocks. This was my first set--four for me, and an identical set for Carla. 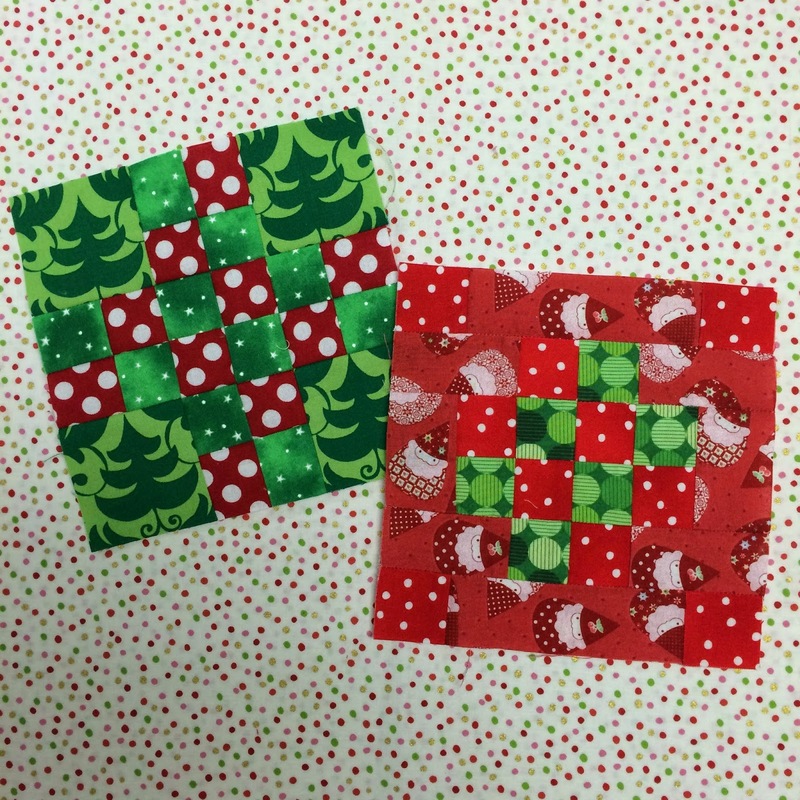 It was so much fun to choose the fabrics for the blocks each month, and to open that package from Carla to see what fabric choices she had made. At some point she showed a peek at the fabric she was going to use for the backing. 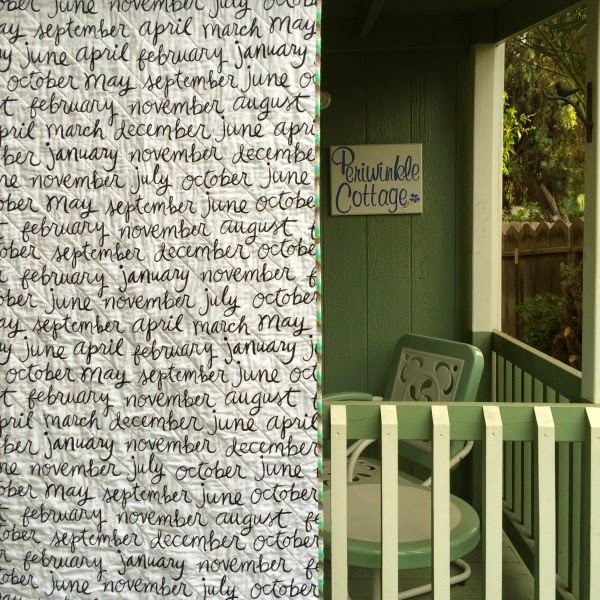 It was a simple texty print with all the months of the year--perfect. I ordered the same thing! 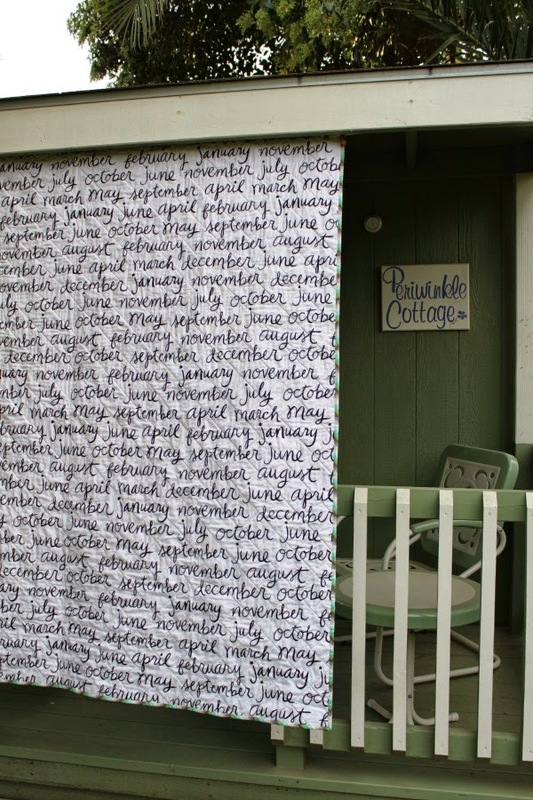 ("8 days a week" by Ampersand Design Studio for Windham Fabrics, in case you are curious). Last weekend I worked on the machine quilting, something I am not proficient at, and at this point, straight line quilting is the only thing in my arsenal. I was so anxious to get it completed by today's deadline so there was no way I was going to attempt to try something else. By mid week I was ready to finish the binding, a step of the process that I really enjoy. So are you ready for the unveiling?I'm so happy with this quilt. Working in tandem with a friend whose work I admire so much has been a wonderful connection and we are already talking about another project. 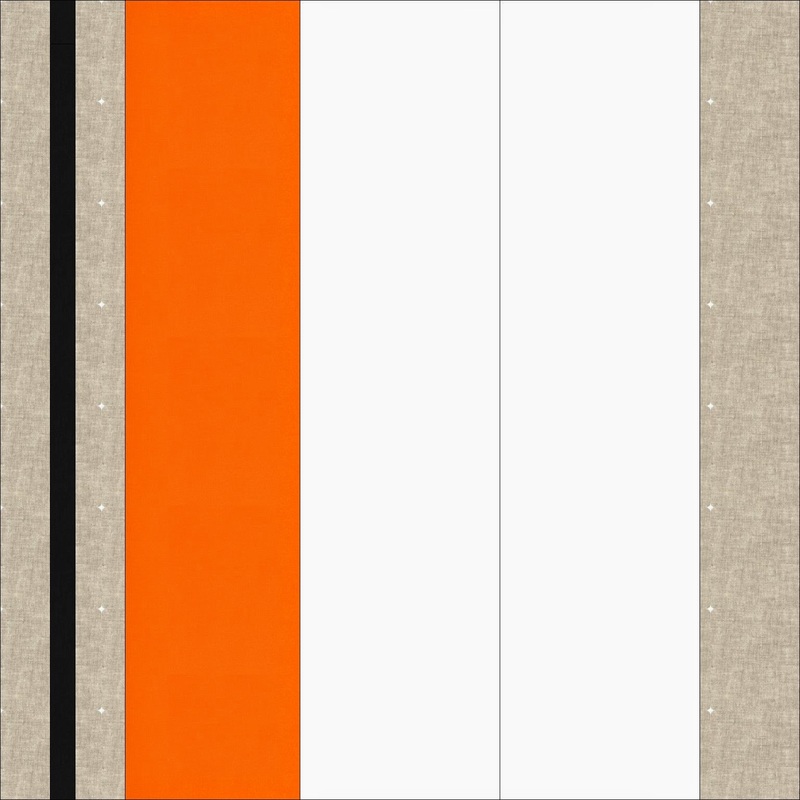 I alternated the blocks in each row, so each of my blocks is sharing a seam with one made by Carla. That thought makes me happy. Here is the back, which I just love. When I was getting ready to piece the backing, I decided that I needed to match up the words and make is seem, well, seamless. It's right about in the center of this portion of the quilt back, a vertical seam. Can't see it? Even close up, I have a hard time finding it myself. Thankfully, it actually has started to feel like fall here in central California. We even had quite a breeze when I took these pictures. Carla, thank you so much for saying yes to that email last year. This will always be a very special quilt. 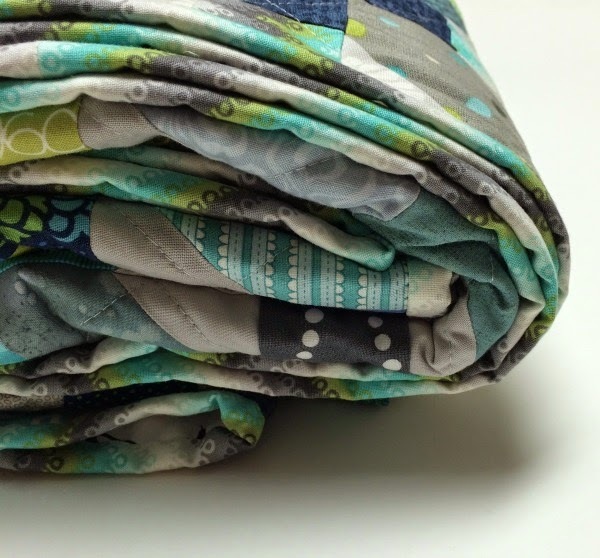 I'm linking up with Crazy Mom Quilts and TGIFF. 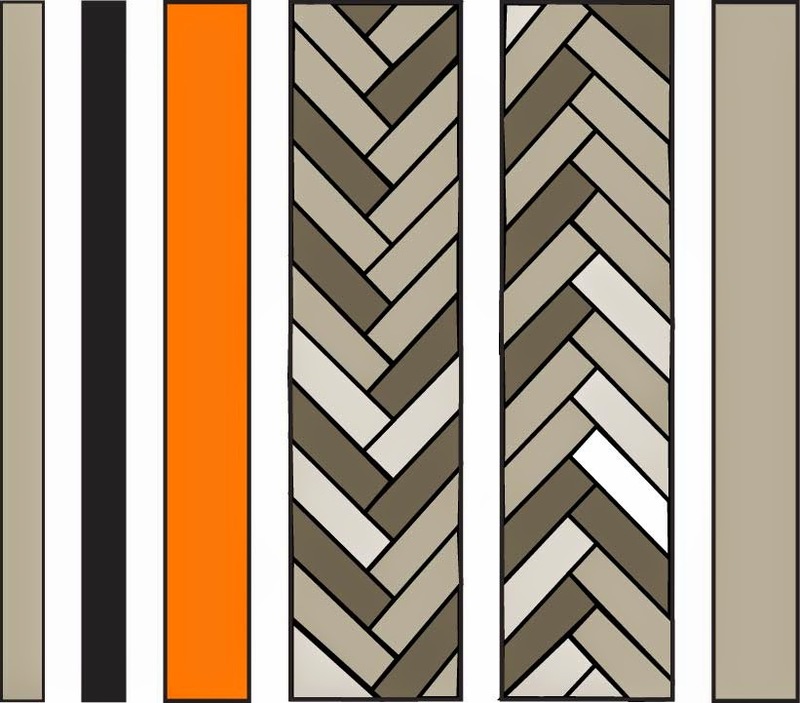 Welcome to this week's edition of Choose Your Own BlockAlong. 1. I am going to love this quilt. All blocks are from Tula Pink's City Sampler Book. 2. It is not going to be the stash buster that I had hoped for. How have I collected so much red and green fabric?? It may not look like much here but there are six stacks of fabric! Starting this week, we will have a linky so you can show your progress and see what everyone else is up to. Please only link if your post includes at least one block in a series you are working on. Also, don't forget to check the progress of Rene' and Michelle. In what seems like kind of a stunning development, I have not one but two finishes today. Neither of them are very large, but nonetheless they are complete. Terri was able to get it to this point, where each segment of the block was "exploded"--just what I needed. I don't think I am underestimating it when I say that Terri is a huge Anna Maria Horner fan. 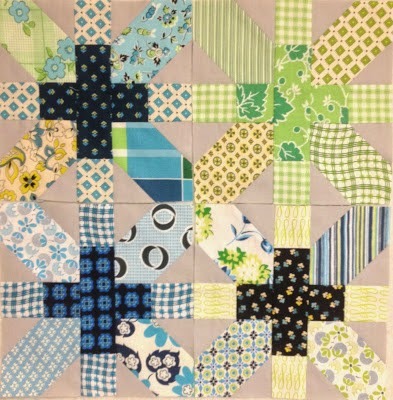 For months, I had wanted to make one block for her using AMH scraps in the braided portion, not only to thank her for the graphic design work but also because she is a very special friend. On the back is one of my favorite prints. If you have an embroidery machine, you really need to check out some of Terri's designs! Next up, this top has been sitting in a stack for what seems like forever. I'm not sure exactly what was holding me up from completing it. I just was never sure what its final outcome should be--pillow? mini quilt? It ended up being a mini, 22" x 22". It's made from a set of Oakshott cottons called "elements" (at least that is what I think they are called--I'm not sure that this range is even available anymore). All the colors are "shot" with white thread, giving them a chalky pastel look. I found the perfect fabric for the back. I ended up doing some easy straight line quilting, which sure didn't take very long, which then made me wonder why I had waited so long! Anyway, I'm giving it away! Just leave a comment and let me know if you have ever made anything with shot cottons. I'll choose a winner on Sunday, September 14. And...Mark has been busy in his glass shop as well. He had two custom orders and they are so spectacular that I had to share them. 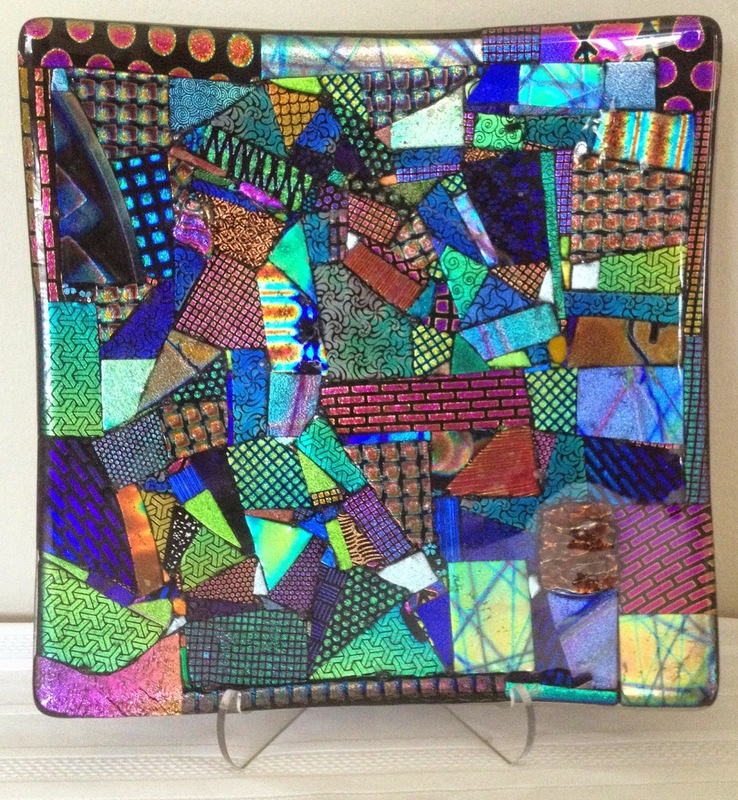 They are 12" platters made from dichroic glass. Photos do not do them justice. 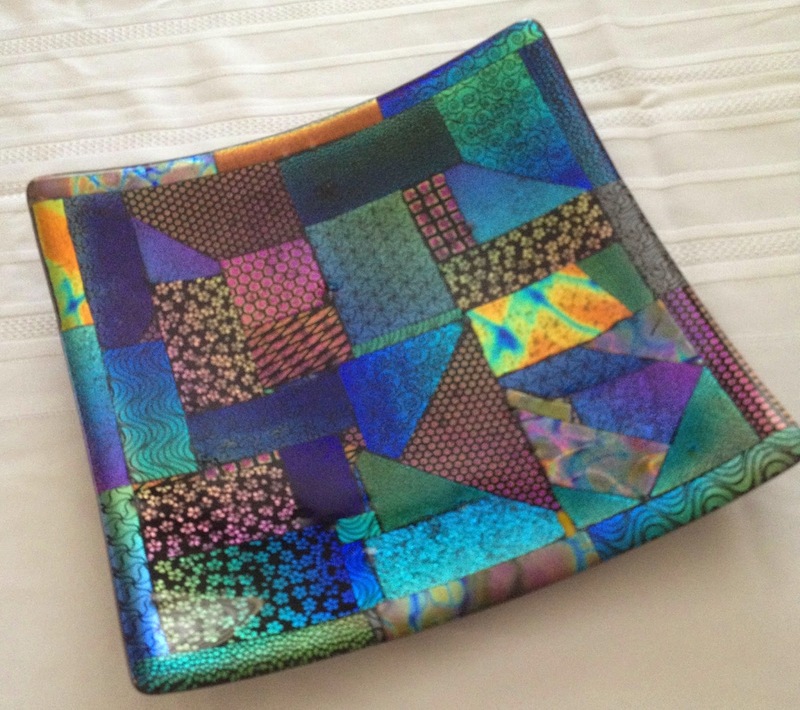 These platters are simply stunning. This is his equivalent of sewing with scraps. I can tell you that especially the bottom platter took forever to piece. Just look at these teensy little slivers of glass. Improv glass making at its finest. After firing the platter first in the kiln (there are three layers of glass that need to be fused together), he then fires it again to give it the gentle slope. 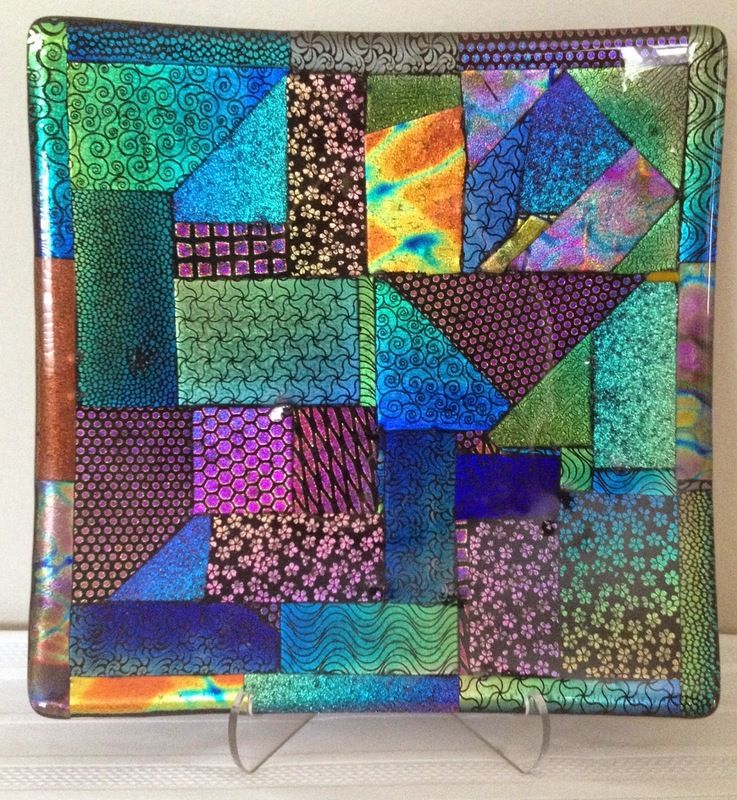 If you are in need of some cool gifts, he I will be posting pictures on his Instgram feed, @doublediamondglass. 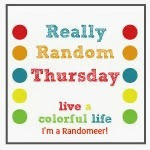 I'm linking up with Crazy Mom Quilts and TGIFF. Have a lovely weekend. Oh, and don't forget to leave a comment for a chance to win. I'm so glad you are here for this week's edition of the "Choose Your Own Block-Along." Rene' designed a button for us, and we have a Flickr group! I can visualize it all in my head. Hope it works out. Don't forget to see what Rene' and Michelle have been up to this week. We plan on having a linky, too--we just haven't decided on how often. What do you think? Weekly, monthly, once a quarter? 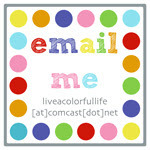 We hope you join us--here, Instagram, Flickr! 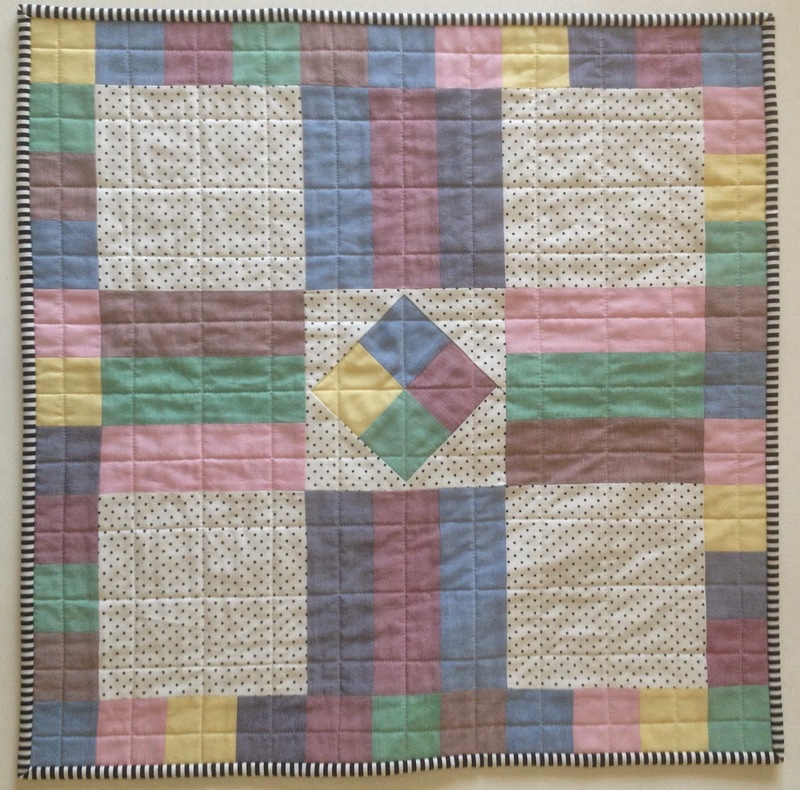 Now I realize that conventionally a quilt back would not be considered a "finish." However, just ask Carla. She and I completed all 111 Farmer's Wife quilt blocks. We blogged about them every Friday for months. 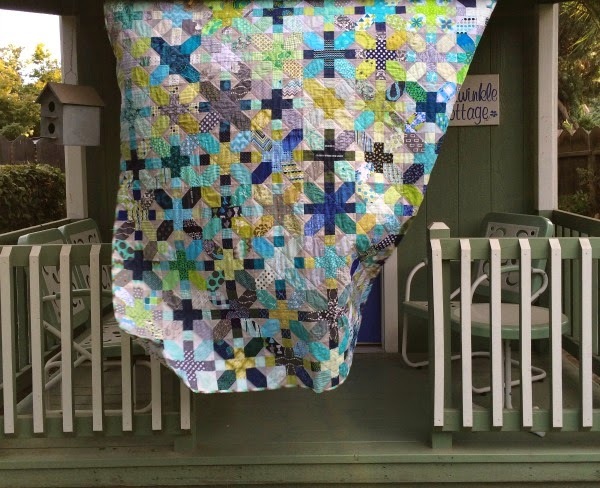 She completed the back to her quilt, sent it off to be quilted, unpicked some of the quilting, sent it off again, and then wrote a post about her beautiful quilt. In 2013. Mine is still not finished. So. High on my priority list has been to finally complete the back so my quilt can finally be completed. Then I can finally write a post telling you what a wonderful experience this was, to make the same two blocks each week with a good friend, because it really WAS a wonderful experience. I can show you my completed Farmer's Wife quilt for the first time. 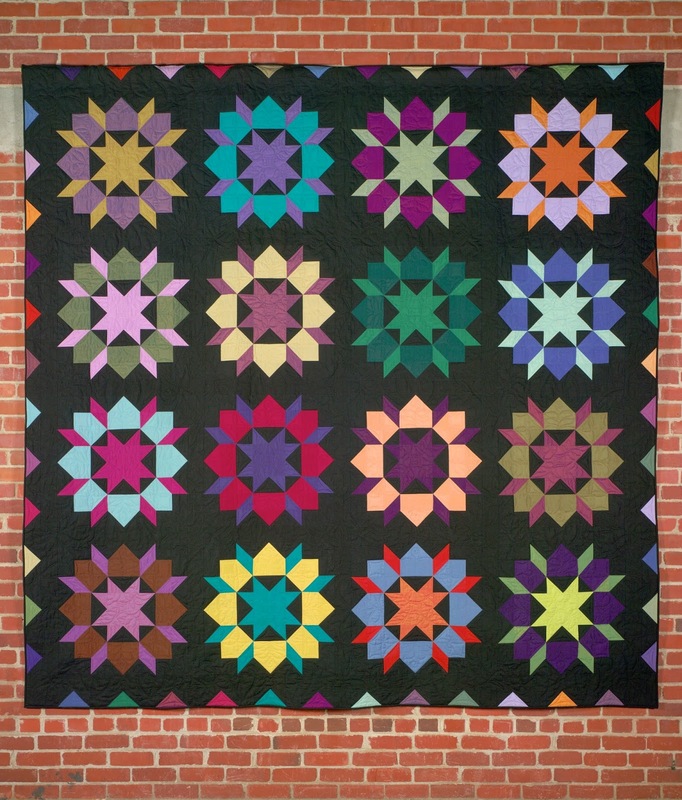 And Carla can reintroduce you to her really stunning quilt. I'm happy to report that the back is done so I'm considering it a "finish" this week. 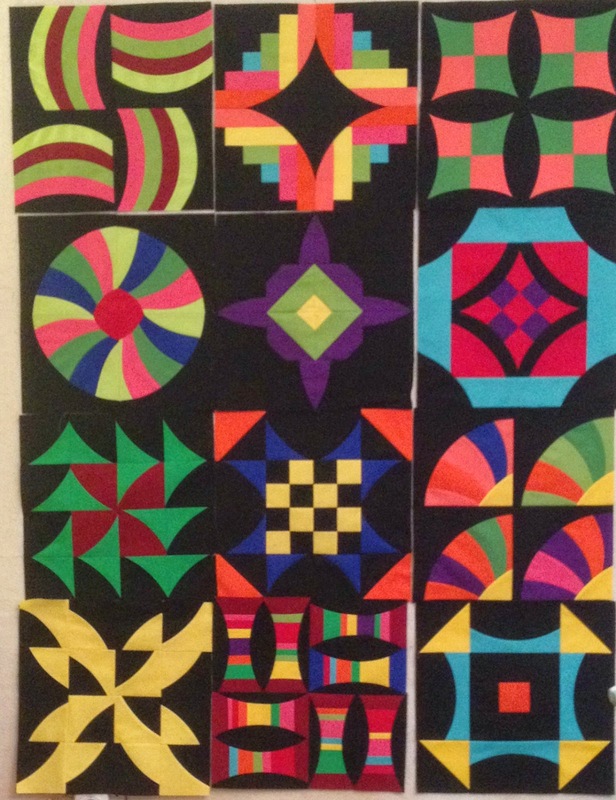 By now the whole thing should be in the hands of my fabulous quilter, Dea, who quilts more than she blogs. :) Lucky for me. I can't wait to share my favorite blocks--you might be surprised--and one that I thoroughly despised. I'm linking up here and here. It always fascinates me how a new project gets started. You have a list of things to finish and you vow not to start anything new. And then, wham! You are pulling fabrics for a brand new project. Awhile back, I found out that my good friends (and sisters) had some projects of their own in the works. 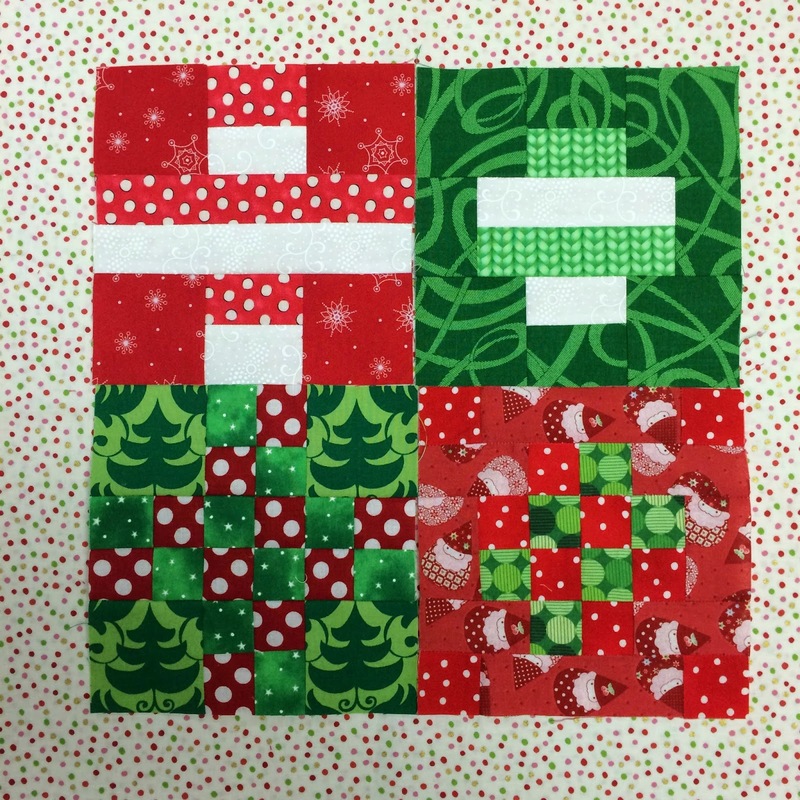 Michelle wanted to make the blocks from Tula Pink's City Sampler, and Rene' wanted to make her Dear Jane blocks. I have had the Tula Pink book for awhile and already had kind of plan formulating in my head. I'm planning on going through the book and making the blocks consecutively. 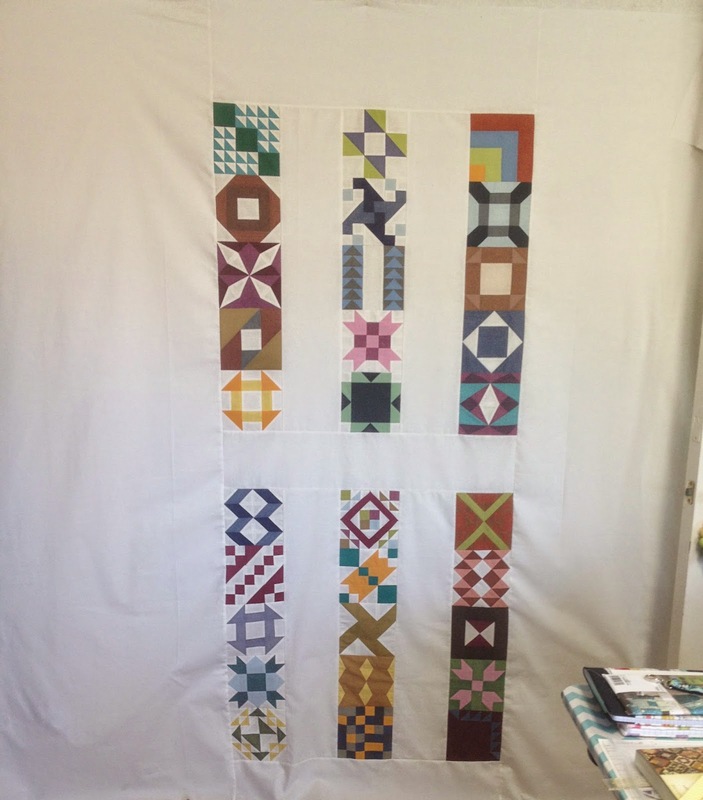 Debbie from A Quilter's Table has a great tutorial on creating a grid to keep track of the blocks. And that way I can get more of a handle on the plan that is floating around in my head. You can see the progress Rene' and Michelle have already made. I hope you join us and make some blocks of your own!